The fate of Pakkilisamy Yoganathan and Ratnasamy Pramanandan, who were abducted on January 11, 2009 while on their way to Wellampitiya, is yet unknown. They had left their home, situated at No: 73, 7th Lane, Bloemendhal Road Kotahena, to go to Wellampitiya on January 11, 2009 afternoon in the former’s Toyota van bearing registration number WP PA 6023. But they never returned nor was the vehicle they were travelling in found. Later investigators uncovered that they had been abducted in and around Hendala Wattala, for ransom together with the vehicle they were travelling in. The investigators, going by the B report, believe that the gold sovereigns that were in the possession of the victims-worth of Rs.2.5 million at that time-is alleged to have been taken over by the abductors. According to Yoganathan’s wife, two Navy officers had visited her few months after her husband’s abduction demanding a ransom to release the two victims. The CID in the ‘B’ report, filed in the Colombo Magistrate’s Court, states that they believe the two youths had been killed thereafter- the same fate that had befallen on the 11 Tamil youths who had been abducted by the Navy the year before. Following the information received regarding the Navy’s involvement in abduction of five students from Kotahena and six more from other parts of the country in 2008 for ransom, the CID- whilst conducting the investigation at the Sri Lanka Maritime Naval Academy at Trincomalee, where the victims are said to have been kept under detention- had received anonymous information about a vehicle belonged to Kasthuriarachchige John Reid. He was among the 11 abductees. According to the information received, the abductors had not only kidnapped Reid, but also had seized the vehicle bearing registration number 56-5536. This vehicle had been used in Trincomalee by Sri Lanka Navy under a forged registration number plate- Navy 2016. The anonymous informant had also told the CID officers that few parts of Reid’s vehicle had being hidden in a safe house at the Navy’s Gemunu Base at Welisara. According to the B report, following the tip off, though the CID investigation team- lead by Inspector Nishantha Silva -discovered John Reid’s vehicle within the Sri Lanka Maritime Naval Academy, the Navy could not produce any legal document to claim the ownership to the vehicle they were using with the mentioned forged registration number. The Navy had deleted the chassis and engine numbers of the vehicle which were beyond recognition, but John Reid’s brother and brother-in-law had identified the vehicle which was owned by the victim. The original paint, which was white, had been changed to blue. The facts reported to courts further state as to how the CID investigation officers, after obtaining a court order from the Colombo Magistrate’s Court, examined Gemunu Base at Welisara for the hidden parts of the vehicle. When going in search of the spare parts, the CID had discovered a heap of vehicle parts hidden in a room adjacent to the Navy Intelligence Sailors’ Hostel. Upon inspecting the closed room, the CID had been able to unearth 72 pieces of a dismantled vehicle. When inquired from the navy officers what those spare parts were, the CID had been informed that they were parts of a vehicle laden with explosives that was taken into custody on an alleged information during the height of the war. But, there were no records to show that the Navy had informed the police or the bomb disposal unit about the vehicle. Meanwhile, the Government Analyst had been able to discover the chassis number of the dismantled vehicle. Using the information, the Department of Motor Traffic traced the name of the owner and found out that it was Pakkilisamy Loganathan of 73, 7th Lane, Bloemendhal Road, Kotahena. Later it had come to light that the owner of this vehicle had gone missing since January 11, 2009. Through further investigations, it was allegedly discovered how Pakkilisamy Yoganathan and Ratnasamy Pramanandan were abducted by the Navy and how the vehicle they were travelling in was seized and how it was dismantled and hidden in the safe house to conceal evidence of the two abduction. From the evidence the CID had recorded statements from the Navy officers, attached to the Gemunu base in Welisara, at the time of the abduction. 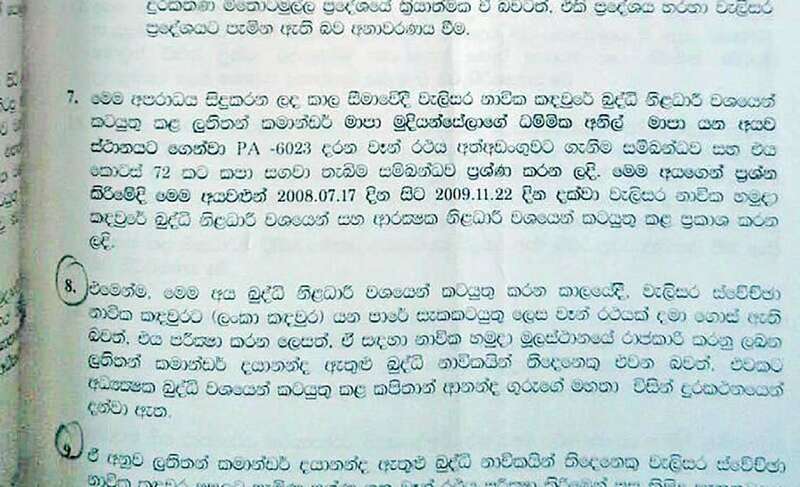 When the abductions in which the Navy was involved in were unearthed as per the B report, the then Commanders Vice Admiral Wasantha Karannagoda and later Ravindra Wijegunaratne had reportedly told President Maithripala Sirisena that all those who were abducted were involved in terrorist activities. They had said that there was no ransom involved regarding these arrests, although the State Intelligence Service, Terrorist Investigation Division, Colombo Crimes Division, Police Narcotic Bureau, Kotahena Police, Intelligence Unit Western Province, Army Intelligence Unit, Air Force Intelligence Unit, Navy Intelligence Unit and Police Special Investigation Unit have cleared their names against any involvement in crimes or terrorist activities. The ‘B’ report further states as to how all requests made by the CID to the then Navy Commander Vice Admiral Wijegunaratne, demanding the release of Navy Intelligence officer Lt. Commander S.D.S.S. Dayananda, fell on deaf ears. The CID has also informed the court that although Vice Admiral Wijegunaratne had once given an assurance that the suspect would be handed over once he finishes a training course he was undergoing, the high ranked Navy official had not kept his promise. Be that as it may, the court had been informed through the ‘B’ report as to how former Colombo DIG Anura Senanayake, who was arrested and is now on bail for concealing evidence in Wasim Thajudeen’s murder, had prevented the officers of the Colombo Crimes Division (CCD) from inquiring into the abduction of these two Tamil youths in Wattala when there was clear evidence against the Navy officers. What is the fate of the Tamil youths abducted by officials of the sea going force in separate incidents in 2008 and 2009? On a complaint lodged by Rajagopal Chitradevi, the wife of Pakkilisamy Yoganathan, on May 9, 2009, the CCD had initiated an investigation. It had revealed how the inquiring officer Sub Inspector CCD, Sumudu Sudesh Wijesinghe was not allowed to record a statement from the accused Lt. Com. Dayananda by the then Director CCD, SSP Anura Senanayake and the task was handed over to SI, Samantha Kulatunge Hettiarachchi, who was on probation.. According to the statements made to the CID by CCD officers, the then SI, Wijesinghe, SI, Hettiarachchi and the former ASP CCD, Asoka Senarath Jayathilake, had Anura Senanayake not intervened in the inquiry and the investigation, the CCD could have saved the lives of Loganathan and Rathnaswamy and also the vehicle from being dismantled. According to SI Sudesh Wijesinghe’s statement, the disappearance of the two Tamil youths was handed over to the CCD on the request of the Ceylon Workers’ Congress MP, R. Yogarajan. On the instructions of the then SP, Ravinda Karawita, Wijesinghe was assigned to investigate the complaints lodged by the wives of the two victims. The statement further states, ‘Going through Loganathan’s mobile phone IMEI (international mobile equipment identity) number, it was discovered that the phone had been used with a different SIM card -071 6887811 by S.D.S.S. Dayananda of 19 C, Pdagoda, Beruwala, Kalutara. This number had been used from January 15, 2009 for four days since Loganathan’s disappearance. It was later revealed that Dayananda is a Navy officer. Although Dayananda was asked to report to the CCD to give a statement, he absconded for several days and had later met SSP Anura Senanayake. When Senanayake informed SI Wijesinghe that Dayananda had picked up the phone from a bus he was travelling and since he could not find out the owner he had made use of the phone. SI Wijesinghe had refused to accept what Dayananda said. As a result Anura Senanayake had repeatedly not allowed Wijesinghe to record the suspect’s statement but asked SI Hettiarachchi to record Dayananda’s statement. ‘In the meantime the CCD had been able to find out the IMEI number of the mobile phone used by the other victim- Rathnaswamy. This phone had been used with another SIM card- 0773952046 which was registered under Secretary to the Commander of the Navy, Commander of the Navy Office, Navy Headquarters, P.O. Box 593, Colombo 1. ‘Although the new developments had been informed to Anura Senanayake, he had not given any instruction to investigate into the abduction. Even Sri Lanka Navy did not reply to any of the letters the CCD wrote to them on this matter’. 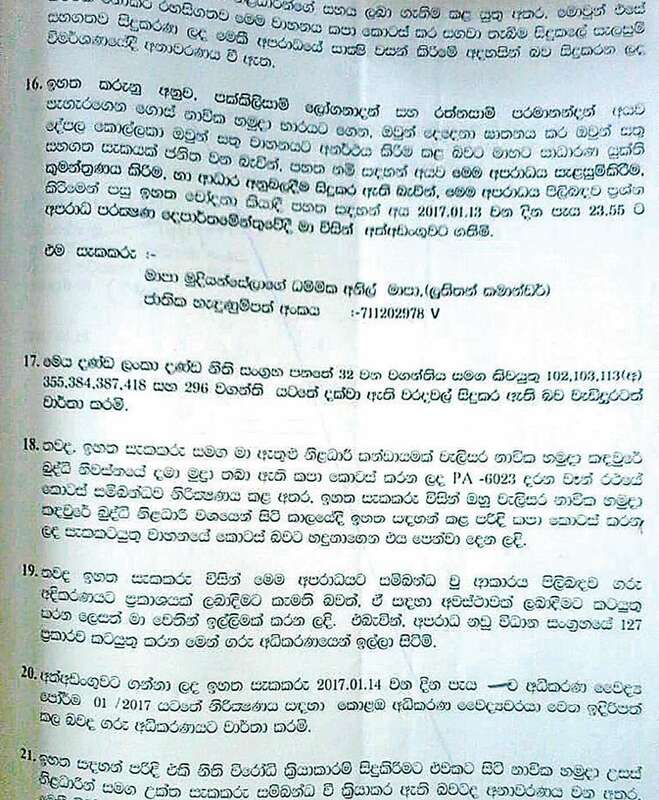 According to the statement made by ASP Ashoka Jayasinghe, he had confirmed what SI, Wijesinghe had said in his statement and had further added as to how he, as the ASP CCD, was in a position to investigate the complaints, but could not on the directives of Anura Senanayake, who had wanted only to discharge the work that he (Anura Senanayake) had assigned, but not any other ‘unnecessary’ work. According to the statement, Anura Senanayake had worked closely with the then Defence Secretary Gotabhaya Rajapaksa and Head of National Intelligence Kapila Hendawitharana. Meanwhile, it has come to light how the then Director Intelligence, Sri Lanka Navy Commander Ananda Guruge, who is also accused of having a hand in the abduction of 11 Tamil youths in 2008 too was involved in the Wattala abduction as well, according to the ‘B’ report filed in courts. Chitradevi speaking to the Daily Mirror said how two Navy officers visited their Kotahena residence, a few months after her husband’s alleged abduction, seeking a ransom to release him. However the conversation between Chitradevi and the said naval officers had come to an abrupt end when Mr. Mohan- brother of the then UNP Provincial Council Member Y.P. Ram- intervened. “Two middle aged men said to be from Sri Lanka Navy came to our door step one morning and wanted to find out details of my husband. When I asked who they were, I was told that they are from the Navy. They were in civil attire I could not understand what they were saying in Sinhala. I sent a message to Mr. Mohan who is a businessman in the vicinity. When Mr. Mohan wanted these two navy officers to show their identity cards, they refused and left immediately. We still don’t know whether they were from the Navy. After the CID informed us that they had found my husband’s dismantled vehicle within the Welisara Navy Camp, we believe that it was the Navy that sent these two men to gather more information about my husband and also seeking ransom,” Chitradevi said. According to Chitradevi, following her husband’s failure to return home, she had lodged a complaint at the Kotahena Police the following morning. “When I took a call to my husband around 5pm the phone was not working and since I could not contact him thereafter and as he did not return even by midnight, I became impatient. My husband had never stayed a night away from home other than at times when he travelled abroad,” Chitradevi said. She further described as to how SI Wijesinghe had told her that he had been stopped from inquiring into the disappearance of the two by the then Director CCD, SSP Anura Senanayake. “I lodged the complaint at the Kotahena Police and met MP, R. Yogarajan. He gave a letter to the CCD requesting to take over the investigation. I lodged a complaint at ‘Sahana Mediriya’ at the Police Headquarters, but to no avail as Anura Senanayake had prevented the CCD Officers from further investigating,” Chitradevi said. When contacted Navy Spokesman Com. Dinesh Bandara, to obtain a comment with regard to the Navy’s failure to assist the CID to apprehend suspects involved in the abduction of the two Tamil youths in 2009 and the 11 Tamil youths in 2008, Com. Bandara said that he would direct the questions to the relevant departments at SLN and make a statement to the Daily mirror . Although several reminders were given to the Navy Spokesman during the past week seeking a statement from them, the Navy Spokesman did not respond to any of the calls made thereafter nor sent a comment till the paper went to print. Meanwhile all attempts made to contact Police Spokesman SP Ruwan Gunasekera for a comment to find out as to whether the CID is dragging its feet by not recording a statement from the main suspect into the Wattala abduction, were unsuccessful as SP Gunasekera did not respond to Daily mirror calls. Whoever involved in this matter have to give death penalty. All the officers who involved in vehicle registration department, military, navy, police and individuals must give death penalty. according to the report hope there must be more addeptions might have happened. There are many human rights vouletions happened before even now. All the culprits must give death penalty. The sad reality of the police force in Sri Lanka. Law enforcement system needs independence.